What Else Can I Expect from an Online Homeland Security Associate Degree Program? Homeland security is an interdisciplinary field concerned with maximizing public safety and security throughout the United States. The term has been commonly used since 2002, when the Bush Administration created the U.S. Department of Homeland Security in the wake of the 9/11 terrorist attacks. Homeland security encompasses a wide range of professions, including emergency management and logistics, law enforcement and criminal justice, fire protection, public health and information security. An associate degree in homeland security will introduce students to the fundamental areas of this exciting, often challenging field. Coursework will delve into topics like terrorism, the justice system, disaster response, epidemiology and cybersecurity. Homeland security associate programs often include internships, which allow students to receive supervised onsite training from experienced professionals. A capstone research project may be required, as well. Many of today's students are choosing to earn their associate degree in homeland security online. Web-based students follow the same rigorous curriculum as their brick-and-mortar counterparts, leading to the same number of job opportunities after graduation. The asynchronous (or self-paced) schedule and study-from-home format are also ideal for students with part-time jobs, childcare duties and other responsibilities that could possibly interfere with campus-based learning. Learn more about what you can do with an online associate in homeland security and what kind of career opportunities you can look forward to with this comprehensive guide. WILL AN ONLINE ASSOCIATE IN HOMELAND SECURITY PROVIDE ME WITH THE SKILLS I NEED TO ADVANCE MY CAREER? Associate in homeland security online degree programs prepare students for different disaster and emergency scenarios. Many programs are geared toward students with specific career pathways, such as law enforcement, information technology security or public health. Internships can also boost a student's skill set in key areas, and provide them with real-world working experience. WILL AN ONLINE ASSOCIATE IN HOMELAND SECURITY PROGRAM WORK WITH MY SCHEDULE? Associate in homeland security online degree programs offer a flexible alternative to traditional higher education. Students are able download course lectures and readings, participate in virtual discussions with other students, submit written assignments, take exams and communicate with their professors on their own schedule. Current educational technology also allows them to study away from their home computer using a laptop, tablet, smartphone and other Wi-Fi-compatible devices. WHAT JOBS CAN I GET WITH MY ASSOCIATE IN HOMELAND SECURITY? Job availability for homeland security associate degree recipients will largely depend on their career goals. A growing number of homeland security professionals work in tech-related roles, such as information security analysts, cybersecurity specialists and network administrators. Law enforcement is another popular career destination for homeland security degree recipients; jobs are widely available in local, state and federal law enforcement agencies. Other graduates with an associate in homeland security go on to become logisticians, project coordinators or emergency management and response personnel. WHAT ARE THE BEST ONLINE ASSOCIATE IN HOMELAND SECURITY PROGRAMS? Choosing a program is an incredibly personal decision, and only you can properly evaluate whether a target school's strengths match your educational needs. 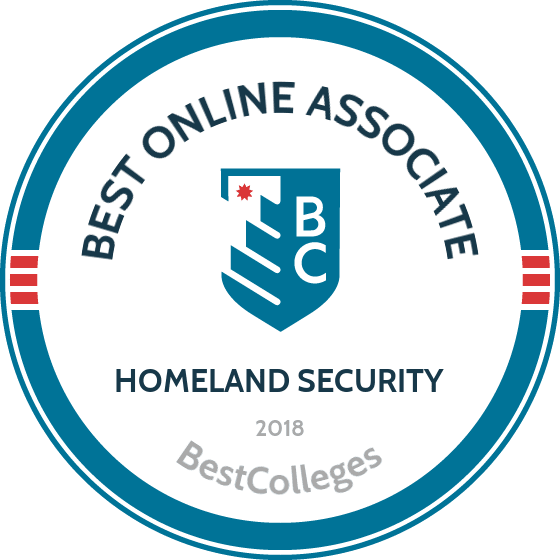 The following ranked list of schools should serve as a helpful starting point in your search for the best online associate in homeland security programs in the United States. If you are considering an online associate in homeland security, be sure to contact admissions specialists at different colleges and universities to learn more their about specific requirements and offerings. Keiser is one of Florida's largest independent career universities, and its online associate in homeland security gives students an in-depth look into the Department of Homeland Security. Students learn how to identify and handle hazardous materials, and how to respond and recover from both domestic and international acts of terrorism. The program comprises 60 total credit hours, including 36 credits of general education courses and 24 elective credits. Students attend one accelerated class at a time, each of which lasts four weeks. Graduates will be prepared for entry-level employment in the field. Keiser University and Keiser Mills Foundation have provided nearly $44 million in scholarships to US and international students, and have had an impact on over 30,000 Florida jobs. Keiser's one-class approach combined with a career-focused curriculum ensures a flexible, affordable education without sacrificing quality. The online associate in homeland security and emergency management at Georgia Military College shows students how to identify various agencies involved in homeland security, and evaluate the role of homeland security within state, federal, and local governments. Students can pursue either an associate of arts (AA) or associate of science (AS) degree in homeland security. The curriculum focuses on terrorism studies, homeland security law, emergency management, strategic planning, and risk analysis. Graduates eventually go on to secure work in areas of emergency management, intelligence analysis, the Federal Bureau of Investigation (FBI), or the Secret Service, just to name a few. GMC's homeland security program specifically prepares to continue their education at a four-year university, and has transfer agreements with 35 universities that guarantee GMC graduates' admission. GMC is one of only five military-friendly junior colleges in the US, but is open to all students regardless of military background. With an average class size of 16 students and free tutoring, its character-based philosophy focuses on ethics, character development, civic duty, and overall student success. Located in Pittsburgh, Pennsylvania, the Community College of Allegheny County is dedicated to providing affordable higher education and professional training to all students. Many of CCAC’s academic programs can be accessed by distance learners, either through a fully remote pathway or a hybrid delivery method. The online associate of science in homeland security highlights risk management, security systems integration, and the political implications of terrorism. Graduates go on to occupy positions as border patrol agents, airport security officers, and cybersecurity specialists. The curriculum totals 61 to 63 credits and includes course topics like emergency preparedness, information security, and emergency medical services. Several of the courses also come with the option to obtain professional certification. As a result, CCAC offers one of the best online associate in homeland security programs for career development. Trident Tech's main campus resides in Charleston, with seven more campuses throughout South Carolina, including an online college. Its online associate degree in homeland security management prepares students to take on exciting leadership positions as security officers, security officer screeners, program analysts, or mission support specialists. Students learn about international and domestic terrorism, infrastructure protection, strategic planning for security, international relations, intelligence operations, and program management. This associate of applied science (AAS) degree comprises 66 semester credit hours; each semester is comprised of two seven-week terms. TTC's commitment to affordable, innovative educational programs allows students to thrive for less than half the cost of a four-year college. Financial aid includes the SC lottery-funded tuition assistance and more than 100 scholarships available through the TTC Foundation. There is no formally recognized accreditor for associate degree programs in this field. Please defer to an individual school's regional or national accreditation status. The Bureau of Labor Statistics (BLS) notes that homeland security jobs are available through a wide range of agencies and organizations. More than 240,000 individuals are currently employed by the U.S. Department of Homeland Security; this number has risen roughly 31% over the last decade. Other federal agencies that hire homeland security specialists include the U.S. Department of Labor, the Federal Emergency Management Agency (FEMA) and the U.S. Department of State's Bureau of Diplomatic Security. State and local government agencies often hire police officers, firefighters, paramedics and other homeland security personnel classified as 'first responders'. A growing number of homeland security jobs are available through private companies and nonprofit organizations, as well. Due to the high demand for qualified security and safety specialists, the employment outlook for the homeland security sector is fairly strong. Using BLS data, the following table looks at the 10-year growth projections for four of the most common careers in homeland security. As the table indicates, more than 110,000 new jobs will be created for these four occupations alone between 2014 and 2024. Due to the extensive number of job titles that fall within the field, salary expectations for homeland security professionals will often vary by an employee's area of specialization, as well as the agency or organization that employs them. The next table looks at career salary growth expectations for four leading employers of homeland security personnel. Of the four organizations listed on the table, employees of the Department of Homeland Security reported the highest rates of salary growth: a staggering 124.5% increase between the entry-level and late-career phases. FEMA employees placed second with 57.4% salary growth, followed by FBI employees with 38.8% growth. Students who graduate with an associate in homeland security will be qualified for dozens of positions in different organizations and agencies, although individual eligibility will depend on additional factors like experience level and city/state of employment. Four popular career pathways in homeland security are outlined in the section below. Police and Detectives: Although day-to-day duties will vary, police and detectives follow the same guiding objective: to protect people, property and natural resources from criminal threats and disasters. Police officers play a direct role by conducting patrols in their areas of jurisdiction, while detectives oversee the investigation process whenever a crime is committed. Postdegree training and certification is usually required for police and detectives; specific requirements vary by agency. Project Coordinators: Project coordinators oversee the various administrative and logistical tasks associated with short- and long-term projects. These employees are found throughout the homeland security sector; their projects often concern emergency response, disaster relief and reconstruction efforts, as well as the development and evaluation of contingency plans. Project Coordinators: Information security analysts design, develop, implement and evaluate different programs and tools used to safeguard networks and computer systems from outside threats. These threats may concern terrorism, hacking and other criminal activities, as well as information leaks, equipment malfunctions and other technical issues. Security analysts will conduct thorough investigations whenever their organization is attacked, and revise their security systems accordingly to prepare for future disruptions. Logisticians: These professionals are responsible for coordinating various resources ― such as food, water, supplies, transportation and manpower ― that are required in emergency and disaster scenarios. Logisticians must keep a thorough inventory and perform regular checks to ensure their supply chain is up to date, and keep meticulous financial records for their company or organization. National Homeland Security Association: The NHSA sponsors a national homeland security personnel conference, which was first held in 2005. The association's website also features an extensive blog network, career tools, and archived transcripts from the most recent conferences. International Association for Counterterrorism and Security Professionals: The IACSP's mission is centered around two overarching goals: the development and dissemination of tools and resources used to minimize the threat of terrorism, and promotion of legal and ethical behavior within counterterrorism. Member benefits include online journal and newsletter subscriptions, discounts on entrance fees to IACSP events, and access to additional resources on the organization's website. SEARCH: SEARCH is a national nonprofit organization that seeks to connect and improve communication between various state, local, and tribal law enforcement and public safety agencies. SEARCH's website is a compendium of resources: visitors will find information about cyber-crime, data analysis, public safety, and other subfields of law enforcement and homeland security, along with podcasts, blog posts, and other multimedia resources.